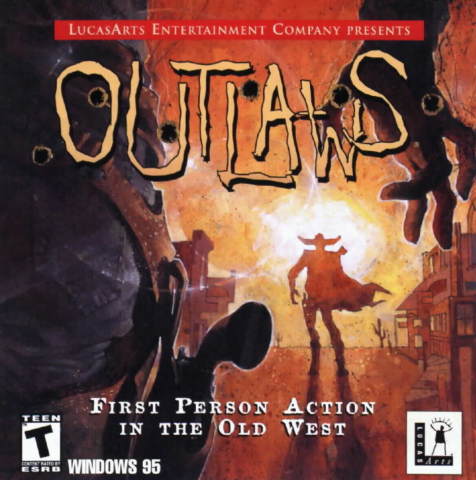 Outlaws is the trailblazing Western first-person shooter they never talk about. It plopped out discreetly into the shadows of Quake and the soon-to-follow Half-Life. It didn't have the graphical or technological oomph, but the fearless souls who immersed themselves in the *real* experience – the Ugly difficulty mode – are now its undying zealots. That includes John Romero. Just sayin'! The zany initial credits roll is a composite of every single art style before the opening cinematic settles into a rougher version of the Curse of Monkey Island technique (running on the same graphics engine, in fact). If you've grown sensitive to tropes of the kind that get "Social Justice Warriors" all riled-up, you're going to have to turn your brain off for the narrative here; at least the artwork is quaint and the dialogue "authentic". In fact, while I don't recollect seeing literally a single one myself (I grew up on James Bond! ), I think Eastwood & Co. would probably feel a bit ripped-off. When you're ready to start your inevitable pursuit of vengeance in the first mission, you're in for some fairly barren landscapes with hardly any "flavor art" cluttering the in- and outdoors areas, making you wonder whether it's going to be any good. Soon you'll recognize it for what it is: a super-realistic no-nonsense shooting gallery that you could picture having been used in sheriff training in an alternate timeline where VR was invented before horseless carriages. Voice-acting is a suprisingly large part of the game's canvas: not just in the cinematics, but there isn't even any background music in the levels themselves*. It starts with a hush as pregnant as the lady in the Duke Nukem 3D episode four intro – a hush you can easily imagine having had the direct antecedent of the baddies scrambling into positions around the perimeters, inside the buildings, in the cellars, lofts and outhouses. Just like in a Western. This silence is usually first broken by gunfire. Hope it's yours! In the twenty-odd minutes that follow you'll hear the even flow of slurs and taunts through whiskey'd throats and gritted teeth. You're going to be all ears as you're triangulating their generators. Expert players may even learn to recognize each enemy type by their voice so as to know if it's a shotgunner or a pistol-whipper skulking around the corner. Yes, the corners. Corners, beams, rails, fences... even the little cracks between closed doors and walls carry significance in your gingerly massacre. The enemies know when they're in and out of sight, ducking down and sitting behind cover, then popping up to take air-borne stabs at you... The experience vividly brought up Counter-Strike or Rainbow Six with jumpshots, holding narrow angles, and looking both ways as you advance. It felt like unalerted enemies take critical damage: something that fits the methodical and brainy gameplay perfectly. 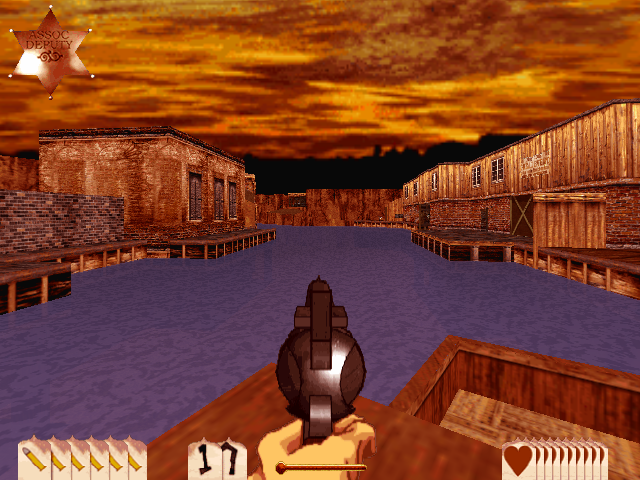 In fact, the same words describe LucasArts' top-notch QA, with generally immaculate design and balancing throughout: all the weapons are usable, there weren't any egregious cheapshots by the level authors, nor did I get badly stuck except for once or twice despite the realistic graphics causing parts of levels to blend together (just check all the shelves and corners carefully). If anything, the Build engine games could have taken half-a-page off the "Outlaws Bible" to be even better in some ways, no doubt. Like most games I really cared about, I do have a lot of IFIs for this one as well: Early into the first mission, and in some of the historical missions also, I thought ammo conservation was going to be something of the essence but you'll generally end up on maxed-out everything towards the end, so more effort could have been put into this (or am I just too good? ;)). While the hostiles have very servicable A.I. they could really have done something with the friendlies as well: they just run around like headless chicken getting in the way instead of taking cover or simply shouting "Don't shoot! "; you're likely to frag a few by accident. Crouching is almost a bit too powerful with the player getting no clever points jumping around and strafing instead, in the single player at least. I would also have loved to see darkness having some effect on the enemies instead of just you. While it's very rare to see the level of effort the team went to to make the main villains unique, some of the actual boss fights are kind of a gongshow. The problem is either it's too easy, or if you're doing the Sheriff Training, you'll want to finish them off with a knife (for extra points to gain access to some bonus areas), but because the knives don't seem to hurt them almost at all (the damage from guns is ridiculous by comparison), you just have to shoot them some, save the game, shoot them some more, save again until you've figured out exactly how many hits they can take. It would have been better to have the game display a health bar. It doesn't help that the knives, like dynamite, have oversized bounding boxes that makes it ridiculously hard to get them to fly around corners and edges. I see the strategy guide (included in the GOG package and fairly well-written) suggests creeping close and stabbing them instead, which I've been told is instant death/unconsciousness. Not exactly intuitive, especially as they're never unaware of you coming. Aside from the single player, there's a whole swag bag of custom maps downloadable off theoutlawdad or olhideout, the latter of which also has reviews for some maps. They're created through an evidently easy-to-use editor called Lawmaker. Most of the maps are for deathmatches, but the multiplayer is still getting action to this day (there's a Facebook group apparently, look for "Outlaws Players Lucas Arts") and I can only imagine it's hilarious – in fact reviewers of the era seem to have enjoyed it plenty. In summary, the game isn't perfect, but still constitutes required knowledge for the standardized test. It represents a real rarity, especially for 1997; perhaps the first "thinking man's FPS" and one of only a handful that render the Wild West at all, let alone this reel-alistically. I basically never got bored of it because of the quality-over-quantity attitude. Just heed the constant taunts: "Don't be a fool!" I don't want to give the impression you can't enjoy the game on lesser difficulties, btw: it's just not the same tactical shooter then and it won't necessarily stand up next to some of the more arcadey ones you've played. *It's a testament to the game's gameplay that I was engrossed enough not to realize the missing soundtrack in the missions themselves, caused by a bug in the GOG version. I don't know if I would have compared it to Counter-Strike with an "authentic" Wild West jukebox in my ears. I've been informed that the short tracklist, while looping inside each given mission, evolves as you get into later ones, so keep tuning in to it every now and then. There's various random technical issues some get that GOG may or may not be able to help you with. I don't want to make it sound like the game is horribly unplayable – it's just awkwardly in the middle of the DOS and modern Windows eras so it's hardly a surprise little figs might crop up. Only one of them was causing me any major gray hairs for a little while until I troubleshot it myself (appropriate for this kind of game!). Here's the few tips I can give you. Run the game in 3DFX. This should be selected in the GOG graphics setup by default. If you get no music during the gameplay itself, rename OLWIN.exe to something else and make sure the game is launching through that .exe. There's an issue with rendering that may cause the dynamite to be invisible. Potential workaround. The game will pass through the desktop whenever switching between cutscenes, the menu, and the game. This might be fixed by installing different NVIDIA drivers. See the Waltorius review for details. Because of some engine thing, when firing uphill, you have to aim higher than it looks like you should, and when firing downhill, lower. The train mission can bug out, on Ugly at least: if you don't get any keys from killing the guys in the first car past the open-air one, you'll have to restart the level until you do. It's not far from the start, luckily. In the Historical Mission called "Civil War", once you've entered the second half through a loading screen, there's a small house directly ahead. You'll end up going into the upstairs of that house. There, you'll find a room with lots of dynamite on the floor and on top of a crate with a guy behind it (on Ugly at least). You'll want to save the game before entering the room, because I found it corrupted all save files that I made after touching specifically the dynamite laid on the crate (in the shape of an 'H'), either picking it up or also sometimes if it gets blown up in the firefight. Instead, you'll want to take the guy out first, then type in "OLAIRHEAD" to activate flight. This also makes you able to squeeze through small gaps so you should be able to avoid the three sticks altogether. You do want to get the bigger hunk in the open crate, then simply fly back and hopefully your saves will be fine. You might get crashing when saving the game inside the Deputys' Clubhouse part of "Marshall Training", or when trying to leave it by nudging the horse. These seem to be temporary, but there's nothing interesting in there anyway. The default gamma is probably too much on the safe side, and may not even be what the devs actually planned their levels around. There simply isn't any need for the lamp at all. Meanwhile, if you set the gamma to the minimum, it suddenly makes a lot more sense as darkness really poses a threat. I highly recommend giving this a try from the get-go. You start the game with two other weapons aside from your pistol, the ones in the 1 and 3 slots. The one that looks like a shotgun (to my untrained eyes anyway) is not a shotgun. It's a rifle. It's a long-distance weapon. Use it so! Once you've come across it, the scoped rifle view is entered simply by hitting '3' again. If you're tempted to use the "restart level" feature, know that it causes you to go back to your default gear, including losing the scope. Fun challenge if you feel confident though. There's no way to end the four single-serving Historical Missions: just leave through the menu once it says "mission successful". To end a Marshall Training mission, you have to *nudge* your horse. I'm not really sure if the Sheriff Training is the best way to start playing (despite what the Strategy Guide says), seeing as Bloody Mary's mission specifically is really tough and there's often ammo problems at first that you'll mostly never experience during the main story. Some levels have these stupid jumps you have to do to get inside a narrow gap: the correct technique seems to be to hold crouch first, then hold jump. Sneaking (the "slow" toggle) is actually useful in this game so make sure to bind it where you can reach it. Hold the "slow" toggle to lock the y-axis if playing with a joystick. Makes sniping multiple guys standing at the same height much easier. If you can't wrap your head around the connection between shots landed and whether someone's going to be dead yet, it might be because (as per the strategy guide) the enemies don't have strict types as in most games, instead varying in parameters such as, indeed, their health total. Like it or loathe it, you're better off at least knowing about it. There's also the fact that peripheral (limb) shots deal a lot less damage on enemies as well as Marshal himself, so it's sometimes going to feel kinda finicky, and you just have to never assume someone's going to die to your next bullet. The default crosshair covers up too much of the view for my liking so I switched it off, and I can only recommend this if you're FPS-savvy. It feels more rewarding and immersive to aim that way. Reloading is the second-most-important command, so binding it on Mouse 2 is probably a good idea. Note that the projectiles inherit your own velocity so run forwards if you want them to fly further. If you're getting bored of the basic experience, you might do what I did and revert to auldschuul keyboard controls where one hand replaces the mouse on the numpad. The other way to do this is if you have a joystick. I had a good bit of fun playing one-handed joystick + keyboard, despite both methods having a bug whereby micro-scale movements are a bit jittery. The commands for looking left, right or behind you should really have caused the player to turn in those directions instead and they would have made a lot of sense with these "archaic" controls. In the Historical Mission called "Wharf Town", if you want to avoid the aforementioned sequence breaks, simply refrain from jumping out of water onto jetties unless there's a "step ladder" lowered. Those are supposed to act as checkpoints. Also don't jump onto or across the floodgate until it's closed (I think).